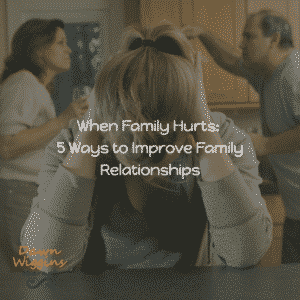 To learn more about how to improve your family relationships, you can watch this short video to help you with your process. The mind is sneaky and it wants to analyze what everyone else is doing wrong. If you find yourself analyzing someone else like your husband, wife, life partner, child, mother, father, or another family member, you understand this is a huge red flag that YOU have work to do. Learn to let go. This means learning to control the only thing you can …. YOU. Begin using some techniques to redirect your thoughts and your motives. Choose to believe that you can heal without their participation. Work with the idea that your thoughts are JUST THOUGHTS and they only have as much power as you give them. It doesn’t matter if you are a parent, an adult child or a sibling. We all tend towards wanting love and acceptance from our family relationships. If you are not receiving validation from your family, be willing to receive it from others. Spend time with those who willingly share love and acceptance. Sometimes we need to supplement our family of birth with family of choice. If you tend to hold on to anger or resentment it is because it serves as evidence and energy to validate your pain. Why do you want to hold onto pain? Letting go of your resentment will not condone another person’s hurtful behavior. Letting go means you are taking fruitful steps towards emotional freedom! I once held onto a letter that caused an immense amount of pain. I used it to remind myself that I wasn’t crazy and the author of the letter had harmed me. Eventually I realized that rereading the letter was stirring up pain from the past which was impossible to change. It was then that I could shred the letter and move forward. If a family member invites you into conflict it is helpful to be slow to respond. When we impulsively react from a place of hurt we usually compound the situation. Pause, reflect, consciously choose your response from a place of calm. You are more likely to diffuse the situation and not cause yourself more pain. If you want to improve your family relationships, choose to change yourself. Do this regardless of what your family members choose. You will reap the benefits and no one can take that from you. I am an expert on family relationships. I have decades of experience healing pain in a personal and professional capacity. If you have questions, need guidance or are looking for resources, don’t hesitate to call me at (561) 221-5575 or schedule your on the house consultation today! If it is helpful to you, be sure to subscribe to our love newsletter, leave a comment below and share it!